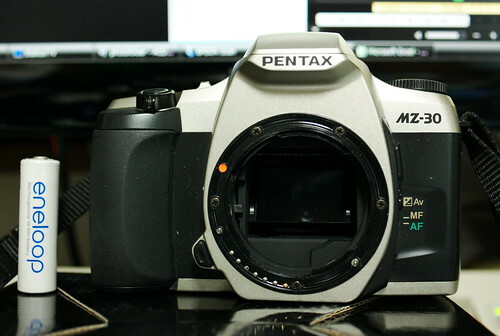 The MZ-30 is a 35mm SLR with autofocus, and was introduced by Pentax in 2000. It utilized KAF lenses. It is also known as the ZX-30. Date back versions are also available. It uses a electronic vertical travelling metal focal plane shutter with speeds from 30 to 1/2000 of a second plus a B mode. The self-timer is electronic with a delay of approx 12 sec. Exposure modes include P with (action, landscape, close-up, portrait and night scenes), Av, Tv, and M modes. 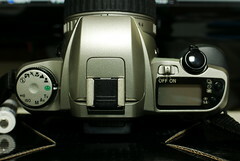 The camera is only compatible with newer F, A, FA type lenses in A mode. The meter has a range of 0 to 21 EV at (ASA 100), and can be set for DX-coded film speeds from 25 to 5000 ISO and manual speeds of 6 to 6400. 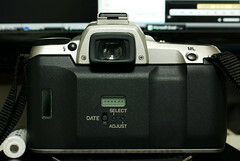 Exposure compensation can be adjusted ± 3 EV at ½ steps. Measurements are made using a silicon photo cell. The built in flash has a GN of 11. The motorized film transport is able to travel at up to 2 fps. It is powered by two CR2 battery. This page was last edited on 18 December 2013, at 18:40.